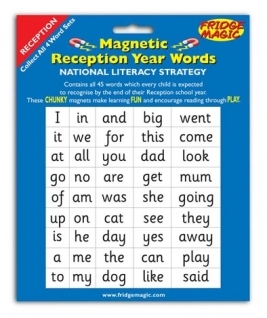 These CHUNKY magnets make learning Fun and encourage reading through Play. The first 45 High Frequency words which every child is expected to recognise by the end of their Reception school year. Part of the National Literacy Strategy. Ideal for at home or school. Chunky Wipe Clean Magnets. Ideal for little fingers to grasp. Use on Magnetic Board, Fridge etc.